For the scientist, see Joseph Thornton (biologist). Joseph Eric Thornton (born July 2, 1979) is a Canadian-American professional ice hockey centre and an alternate captain for the San Jose Sharks of the National Hockey League (NHL). He was selected first overall by the Boston Bruins in the 1997 NHL Entry Draft and went on to play seven seasons with the club, three as its captain. During the 2005–06 season, he was traded to the Sharks. Splitting the campaign between the two teams, he received the Art Ross and Hart Memorial Trophies as the league's leading point-scorer and most valuable player, respectively. Thornton's on-ice vision, strength on the puck, deft passing ability and power forward style of play have led to him becoming one of the league's premier top line centres. Listed at 6-foot-4 and 220 pounds, he has received the nickname Jumbo Joe. His nickname also comes from Jumbo the elephant who was killed in St. Thomas, Ontario in 1885, where Thornton was born. Thornton grew up playing minor hockey in his hometown of St. Thomas, Ontario, for the St. Thomas Travelers. He played "AA" hockey for the Travelers and in peewee won an Ontario Minor Hockey Association (OMHA) championship in 1992–93. His Bantam year was the first for the newly created "AAA" Elgin-Middlesex Chiefs organization, and Thornton joined the "AAA" Elgin-Middlesex Chiefs of the Minor Hockey Alliance of Ontario for the 1993–94 season. The creation of this organization led to the St. Thomas Minor Hockey Association to compete at the "A" level. During his bantam year, he appeared in six games for the Junior B St. Thomas Stars of the Ontario Hockey Association (OHA), scoring eight points in six games as a 14-year-old. The following season, Thornton joined the Stars full-time and reeled off 104 points over 50 games as a 15-year-old, and was subsequently drafted second overall in the 1995 OHL Draft to the Sault Ste. Marie Greyhounds behind Daniel Tkaczuk, who was selected by the Barrie Colts. Beginning in 1995–96, Thornton began a two-year career in the Ontario Hockey League (OHL) with the Greyhounds. He posted a 76-point season in his first year, earning both OHL and CHL Rookie of the Year honours. The following season, Thornton improved to 41 goals and 122 points, second overall in League scoring behind Marc Savard of the Oshawa Generals, and was named to the OHL Second All-Star Team. After his second OHL season, Thornton was selected first overall in the 1997 NHL Entry Draft by the Boston Bruins. Thornton suffered a fractured arm in the Bruins' pre-season but made their roster for the 1997–98 campaign. He scored his first career NHL goal on December 3, 1997, in a 3–0 win against the Philadelphia Flyers. Head Coach Pat Burns was measured in his deployment of Thornton, using him almost exclusively on the fourth line and making him a regular healthy scratch. Averaging eight minutes and five seconds of ice time per game over the course of the season, he registered three goals and seven points in 55 games as a rookie. In the 1998 Stanley Cup playoffs, Thornton went scoreless in six games. In 1998–99, Thornton saw significantly more ice time, averaging 15 minutes and 20 seconds per game, and improved to 41 points in 81 games, as well as a nine-point effort in 11 playoff games. Thornton continued to build into a key player in the Bruins' lineup, increasing his points total in each of the following two campaigns. Prior to the 2002–03 season, he was named team captain, succeeding Jason Allison, who was traded to the Los Angeles Kings in 2001; the captaincy position was vacant for a full season after Allison's departure. In his first season as team captain, Thornton recorded 68 points over 66 games. The following year, he notched his first career 100-point season with 36 goals, a career-high, and 65 assists. He ranked third in NHL point-scoring, behind Peter Forsberg of the Colorado Avalanche and Markus Näslund from the Vancouver Canucks. Thornton's production declined to 73 points in 77 games in the 2003–04 campaign. He suffered a fractured right cheekbone in a fight with New York Rangers centreman Eric Lindros during a game on January 19, 2004. The two power forwards fought after Lindros cross-checked Thornton in the head. The injury required surgery, keeping him out of the lineup for three games. The 2003–04 campaign also saw a drop in Thornton's goal-scoring production that has never since rebounded; his last 30-goal season came during the 2002–03 season. After his production decreased to 73 points over 77 games in 2003–04, Thornton went abroad to play for HC Davos of the Swiss National League A (NLA) due to the 2004–05 NHL lockout. He played on a line with fellow NHL players Rick Nash and Niklas Hagman, helping HC Davos to a League championship and Spengler Cup win. Since then, Nash and Thornton keep a close contact to Arno del Curto and HC Davos, Thornton returns every summer to train for up to a month with the club. With the NHL set to resume in 2005–06, Thornton became a restricted free agent in the summer of 2005 and was reportedly unhappy with the state of the Boston Bruins franchise, as well as the criticism of his play in the Bruins' early playoff exit in 2004. Thornton was under heavy scrutiny for his leadership style and was criticized for being unable to raise his level of play during the playoffs. Thornton re-signed with the team on August 11, 2005, to a three-year deal worth US$20 million. While Thornton was off to a strong start production-wise (33 points in 24 games), the Bruins were struggling in the standings. On November 30, 2005, Thornton was traded to the San Jose Sharks in a four-player deal, which sent forwards Marco Sturm and Wayne Primeau and defenceman Brad Stuart to Boston in exchange for the Bruins captain. Thornton was the team's leading scorer at the time by a substantial margin. Then-Bruins general manager Mike O'Connell later stated in a June 2011 interview that he "would still make the trade," and that it was "satisfying" to see Boston win a Stanley Cup before Thornton's San Jose Sharks did. O'Connell further explained the trade by questioning Thornton's character both on-and-off the ice at the time, contrasting him with Patrice Bergeron, who was in his second full season with the Bruins when the trade took place. O'Connell recalled making the decision with Assistant general manager Jeff Gorton to alternatively build the team around Bergeron. Thornton during a pre-game warmup against the Nashville Predators in 2007. Upon arriving in San Jose, Thornton improved the Sharks' fortunes and found instant chemistry with winger Jonathan Cheechoo. During the absence of usual alternate captain Alyn McCauley from the San Jose lineup, Thornton donned the "A" for the first time as a Shark in a game against the Phoenix Coyotes on March 30, 2006, and wore the "A" whenever McCauley was out of the lineup for the remainder of the season. Tallying 92 points in 58 games with the Sharks after the trade, Thornton finished the season with a League-leading 96 assists and 125 points total to earn the Art Ross Trophy as the League's top scorer. He became the first player to win the award while splitting the season between two teams. Due to Thornton's success, Cheechoo also enjoyed a career-season, winning the Rocket Richard Trophy as the NHL's top goal-scorer with 56 goals. In the 2006 playoffs, however, Thornton was once again criticized for his play, as his production decreased to two goals and nine points in 11 games as the Sharks were ousted in the second round. In the off-season, Thornton was honoured for his regular season play and was awarded the Hart Memorial Trophy as League MVP to go with his Art Ross Trophy. He is the only player in NHL history to win the Hart Trophy while playing for two different teams in the same season. Thornton began the 2006–07 season being awarded a permanent alternate captaincy, but struggled in the first half of the season while suffering from a toe injury that did not heal until January 2007. After recovering, Thornton enjoyed a productive second half, battling Pittsburgh Penguins Sidney Crosby for a second-consecutive scoring title late in the year, eventually finishing six points behind Crosby with 114. With a League-leading 92 assists, Thornton became only the third player in NHL history to record back-to-back 90-assist seasons, joining Wayne Gretzky and Mario Lemieux. Thornton began the 2007 playoffs by recording six assists in the Sharks' first-round series against the Nashville Predators. Advancing to the second round against the Detroit Red Wings, he notched a goal and three assists in the first three games of the series. However, Thornton was effectively neutralized by Red Wings defenceman Nicklas Lidström, for the remainder of the series as the Sharks were eliminated in six games. In the off-season, Thornton signed a three-year contract extension worth US$21.6 million that, keeping him with the Sharks until June 2011. In the 2007–08 season, Thornton finished with 96 points (29 goals and 67 assists) to finish fifth in NHL scoring. In 2008–09, Thornton was named captain of the Western Conference for the 2009 NHL All-Star Game in Montreal. He completed the season with 86 points. In the subsequent post-season, he recorded a goal and four assists in six games as the Sharks were eliminated in the first round by the Anaheim Ducks. In September 2009, before the start of the 2009–10 season, the Sharks acquired Dany Heatley in a three-player trade that sent Thornton's struggling former linemate Jonathan Cheechoo, left winger Milan Michálek and a second-round draft pick to the Ottawa Senators. Thornton, Heatley and Sharks captain Patrick Marleau were joined on the Sharks' top line and enjoyed immediate offensive success together. The trio helped the Sharks to one of their best-ever regular seasons in franchise history. Although the line's production slowed down in the second half of the season, all three Sharks players finished in the League's top 15 in point-scoring. Thornton's 89 points ranked eighth, while Marleau and Heatley finished 14th and 15th in League scoring with 83 and 82 points, respectively. The Sharks entered the 2010 playoffs as the first seed in the Western Conference for the second-consecutive year. After advancing past the Colorado Avalanche and Detroit Red Wings in the first two rounds, the Sharks were eliminated by the Chicago Blackhawks in the Western Conference Finals. Thornton finished the playoffs with a career-high 12 points in 15 games. 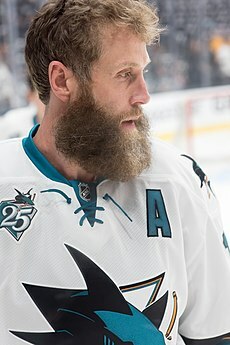 After the elimination, team management vacated all the Sharks' captaincy positions, including Thornton's role as one of the alternate captains. Prior to the 2010–11 season, he was chosen to replace the retiring Rob Blake as the eighth captain in team history on October 7, 2010. Nine days later, he signed a three-year, US$21 million contract extension with the Sharks. Near the start of the 2010–11 season, Thornton scored the fourth hat-trick of his NHL career against Martin Brodeur in a 5–2 win over the New Jersey Devils. In November 2010, Thornton was suspended two games for a controversial hit to the head against St. Louis Blues forward David Perron. Perron missed the remaining 72 games of the 2010–11 season due to post-concussion syndrome. He returned after missing 97 games over 13 months (394 days) on December 3, 2011. Later in the campaign, Thornton eclipsed Marleau as the Sharks' all-time leader in assists. Thornton scored his 1,000th career point with a goal in a game against the Phoenix Coyotes on April 8, 2011. In the first round of the 2011 playoffs, Thornton scored the series-winning goal in overtime of game 6 against the Los Angeles Kings to advance the Sharks to the second round. On January 24, 2014, Thornton signed a three-year contract extension with the Sharks through to the 2017 season. At the end of 2013–14, Thornton ranked 46th on the all-time points leaders (1,194) and 24th on the all-time assist leaders (852) for the NHL. He also became the San Jose Sharks all-time leader in assists, with 567. Thornton finished the 2013–14 season with 11 goals and 65 assists as the Sharks amassed 111 points, just six short of their franchise's all-time-high mark, and were among the favourites to win the Stanley Cup. Facing their in-state rival Los Angeles Kings in the first round of the 2014 playoffs, the Sharks won the first three games in the best of seven series. However, Los Angeles won the next four games and became just the fourth team in NHL history to win a playoff series after trailing three games to none. Thornton finished the playoffs with just two goals and an assist. On August 20, 2014, then-Sharks Head Coach Todd McLellan announced that Thornton had been stripped of his captaincy, and that the Sharks would start the 2014–15 season without a captain. Joe Pavelski was eventually named Sharks' captain at the start of the 2015–16 season. On January 26, 2015, Thornton recorded his 1,300th career point during a game against the Colorado Avalanche with his assist on Joe Pavelski's goal, his second assist of the game. He is the 33rd player in NHL history to reach 1,300 points, 2nd among active players (Jaromír Jágr being first). Thornton recorded 16 goals and 49 assists during the 2014–15 season as the Sharks failed to qualify for the Stanley Cup playoffs for the first time since 2003. Thornton finished the 2015–16 season with 19 goals and 63 assists as the Sharks returned to the playoffs after a one-year slump. In the 2016 playoffs, the Sharks beat the Kings in the first round in 5 games, avenging a previous loss to them two years earlier. In the second round, they beat the Nashville Predators in 7 games and advanced to the Conference Finals for the first time since 2011, where the Sharks beat the St. Louis Blues in 6 games to advance to the Stanley Cup Final for the first time in franchise history. This was also Thornton's first time playing in the SCF in his career. The Sharks, however, lost to the Pittsburgh Penguins in 6 games in the 2016 Stanley Cup Finals. During the Stanley Cup Playoffs Thornton was 5th in points with 21 and 2nd in assists with 18. Joe was also named as one of the final players to Team Canada for the World Cup and was a Second Team All Star for the 2015–16 season. Since Thornton started playing in the NHL in 1997 he has had the most assists with 964 and the most points with 1341. On March 6, 2017, he got his 1,000th NHL assist in a game against the Winnipeg Jets, and became the 13th player in the NHL's history to reach that milestone. On July 1, 2017, Thornton signed a one-year deal to return to the Sharks for the 2017–18 NHL season. Thornton injured his ACL and MCL in January, and missed the remainder of the season recovering from surgery. On July 2, 2018, Thornton signed a one-year deal to return to the Sharks for the 2018–19 NHL season. On November 13, 2018, Thornton scored his 400th career goal to go along with 1500 games played and 1000 assists. As of 2018[update], this feat has only been achieved by six other players in NHL history. On February 11, 2019, in a 7–2 win over the Vancouver Canucks, Thornton passed Gordie Howe for ninth place on the NHL all-time assists list. Thornton (second from right) celebrates a goal during the 2010 Winter Olympics as his San Jose teammates Patrick Marleau (#11) and Dany Heatley (#15) join in. Thornton was named to Canada's national under-20 team for the 1997 World Junior Championships in Switzerland. Underaged at 18 years old, he recorded four points in seven games, helping Canada to a gold medal. Two years later, he made his debut with the Canadian men's team at the 2001 World Championships in Germany. Thornton collected a goal and an assist over six games, as Canada was eliminated in the quarter-finals by the United States. Thornton's next international appearance occurred at the 2004 World Cup. Established by then as a premiere player in the NHL, Thornton tied for third in tournament scoring with six points (a goal and five assists) over six games. He notched two assists in the championship game against Finland, helping Canada to a 3–2 win. At the 2005 IIHF World Championship in Austria, Thornton led all scorers with 16 points (six goals and ten assists) in nine games and was named tournament MVP. Canada advanced to the gold medal game, where they were shut-out 3–0 by the Czech Republic. Thornton made his first appearance in the 2006 Winter Olympics. He recorded three points as Canada was shut out in three of six games, losing to Russia in the quarter-final. Four years later, he was again chosen to Canada's Olympic team for the 2010 Winter Games in Vancouver. Thornton was joined by his Sharks linemates Dany Heatley and Patrick Marleau, as well as Sharks defenceman Dan Boyle, on the squad. The offensive trio of Sharks played on the same line in the Olympics, as well. Thornton registered a goal and an assist over seven games, helping Canada to a gold medal finish. Thornton was later invited to the Canada's hockey camp for the 2014 Winter Olympics, but did not attend due to his son being hospitalized with an illness. Thornton is married to Tabea Pfendsack, whom he met while playing in Switzerland during the 2004–05 NHL lockout. The couple have a daughter and a son. Born in St. Thomas, Ontario, Thornton became a naturalized American citizen in July 2009 at a ceremony in Campbell, California, a suburb of San Jose. Joe and former Sharks teammate Scott Thornton are first cousins. Gord Downie's song "You Me and the B's" (in the album Introduce Yourself) includes a lament about Joe Thornton's trade in 2005. Named to the OHL All-Rookie Team in 1996. Won the Emms Family Award as OHL rookie of the year in 1996. Named the CHL Rookie of the Year in 1996. Named to the OHL Second All-Star Team in 1997. Played in the NHL All-Star Game in 2002, 2003, 2004, 2007, 2008 and 2009 (captain). Won the Art Ross Trophy in 2006. Won the Hart Memorial Trophy in 2006. Named to the NHL First All-Star Team in 2006. Named to the NHL Second All-Star Team in 2003, 2008 and 2016. Won the Spengler Cup with HC Davos in 2004. Won the Swiss ice hockey championship with HC Davos in 2005. Won the World Junior Championships gold medal with Team Canada in 1997. Won the 2010 Winter Olympics gold medal with Canada. Won the World Cup of Hockey with Team Canada in 2016. Only player in NHL history to win the Art Ross Trophy and Hart Memorial Trophy while switching clubs in his winning campaign – 2005–06. Third player in NHL history to record back-to-back 90 assist seasons, with 92 in 2006–07 and 96 in 2005–06 (combined Boston/San Jose). The other two to accomplish this feat are Wayne Gretzky and Mario Lemieux. ^ a b McKeon, Ross (June 23, 2006). "NHL AWARDS / 'Humbled' Thornton named MVP". The San Francisco Chronicle. Retrieved October 19, 2015. ^ a b Associated Press. "ESPN – Thornton traded to Sharks for three players – NHL". Sports.espn.go.com. Retrieved September 27, 2008. ^ Brennan, Pat (September 8, 2010). "Jumbo the elephant leaves a big legend in southern Ontario". Toronto Star. Retrieved April 29, 2018. Joe Thornton, an NHL star with the San Jose Sharks, is known as Jumbo Joe in part because he hails from St. Thomas. ^ Rea, Kyle (July 10, 2010). "St. Thomas honours its hockey hero with banner". St. Thomas Journal. Retrieved April 29, 2018. The nickname is a homage to Jumbo, the famous elephant killed in St. Thomas 125 years ago. ^ nurun.com. "St. Thomas honours its hockey hero with banner". St. Thomas Times-Journal. ^ "Joe Thornton's NHL Profile". National Hockey League. Retrieved March 7, 2011. ^ a b c "Joe Thornton: Bio". The Sports Network. 2015. Retrieved November 12, 2015. ^ "NHL LAST NIGHT; Hasek Blanks Anaheim". New York Times. December 5, 1997. Retrieved January 21, 2009. ^ "1997–1998 – Regular Season – Boston Bruins – Skater – Time on Ice – Time on Ice Per Game". National Hockey League. Retrieved October 22, 2011. ^ "1998–1999 – Regular Season – Boston Bruins – Skater – Time on Ice – Time on Ice Per Game". National Hockey League. Retrieved October 22, 2011. ^ "Thornton to have surgery". Boston Globe. January 22, 2004. Archived from the original on May 27, 2012. Retrieved January 6, 2015. ^ "Joe Thornton". Hockeydraft.ca. Retrieved September 27, 2008. ^ The best coach in Europe, The Harry Potter look-alike is no wizard; simply a coaching genius, 2009-04-15, SZYMON SZEMBERG, IIHF.com. ^ Scott Burnside. "ESPN – What will the new NHL look like? – NHL". Sports.espn.go.com. Retrieved September 27, 2008. ^ a b "Felger & Mazz: Ex-GM Mike O'Connell "Glad" Bruins Won Before Sharks". CBSBoston.com. June 17, 2011. Archived from the original on November 7, 2011. Retrieved October 22, 2011. ^ Gold-Smith, Josh (November 30, 2015). "10 years later: Remembering the Joe Thornton trade". thescore.com. Retrieved March 27, 2018. ^ "Joe Thornton – Mahalo". Mahalo.com. Retrieved October 5, 2008. ^ "The NHL Arena > Joe Thornton No. 19". TheNHLarena.com. July 15, 2007. Archived from the original on April 21, 2009. Retrieved October 19, 2015. ^ "NHL – 2007 Playoffs San Jose Sharks vs. Detroit Red Wings – Yahoo! Sports". Sports.yahoo.com. Retrieved October 5, 2008. ^ Associated Press. "ESPN – Three-year extension keeps Thornton in San Jose through 2011 – NHL". Sports.espn.go.com. Retrieved October 5, 2008. ^ "Ducks complete upset of top-seeded Sharks". ^ LeBrun, Pierre (November 6, 2010). "Joe Thornton suspension upheld". espn.com. Retrieved March 27, 2018. ^ Brown, Jerry (April 9, 2011). "Joe Thornton scores 1,000th NHL point". NHL.com. Retrieved March 27, 2018. ^ "Thornton & Marleau Agree to Three-Year Extensions". San Jose Sharks. January 24, 2014. Retrieved January 24, 2014. ^ "Joe Thornton Stats | Hockey-Reference.com". Hockey-Reference.com. Retrieved November 25, 2018. ^ Pollak, David (August 20, 2014). "Sharks take away Thornton's captaincy; Raffi Torres out indefinitely". Mercury News. Retrieved August 20, 2014. ^ a b Gilmore, Eric (January 27, 2016). "Thornton gets 1,300th point, Sharks top Avalanche". NHL.com. Retrieved March 26, 2018. ^ "Joe Thornton." NHL.com. NHL, n.d. Web. June 26, 2016. ^ "NHL Player Stats in Last 19 Seasons." QuantHockey. QuantHockey.com, n.d. Web. June 26, 2016. ^ "Joe Thornton of Sharks gets 1,000th assist". NHL.com. March 6, 2017. Retrieved March 27, 2018. ^ "Sharks Re-Sign Forward Joe Thornton to a One-Year Contract". nhl.com. Retrieved July 1, 2017. ^ "Thornton could be back this season for Sharks: report". NHL.com. February 22, 2018. Retrieved March 29, 2018. ^ "Sharks' Joe Thornton out multiple weeks after damaging MCL". sportsnet.ca. January 24, 2018. Retrieved March 29, 2018. ^ "Thornton signs one-year contract with Sharks". nhl.com. July 2, 2018. Retrieved July 2, 2018. ^ "Sharks' Joe Thornton: Wins game with 400th goal". nhl.com. November 13, 2018. ^ "Sharks light up DiPietro in NHL debut, trounce Canucks". TSN.ca. February 11, 2019. Retrieved February 12, 2019. ^ "TEAM CANADA CAPTURES SILVER MEDAL AT MEN'S WORLD CHAMPIONSHIP". hockeycanada.ca. May 15, 2005. Retrieved April 29, 2018. ^ Burnside, Scott; LeBrun, Pierre (December 30, 2009). "Breaking down 2010 Canadian team". ESPN. Retrieved April 29, 2013. ^ Pashelka, Curtis (August 26, 2013). "San Jose Sharks' Joe Thornton cancels trip to Canadian Olympic camp". San Jose Mercury News. Retrieved August 26, 2013. ^ Pollak, David (December 12, 2008). "Bachelor days ending for Thornton, and the latest update on Shark FART". Working The Corners. San Jose Mercury News. ^ Emmons, Mark (August 29, 2010). "Sharks' Joe Thornton looking to stay in San Jose". The Mercury News. Retrieved December 10, 2018. ^ "Thornton rehabs knee injury with help of 4-year-old son". NHL.com. March 24, 2018. Retrieved December 10, 2018. ^ Mark Emmons (August 29, 2010). "Sharks' Joe Thornton looking to stay in San Jose". The Mercury News. Retrieved January 25, 2018. ^ Pyette, Ryan (December 10, 2005). "Sharks' Scott Thornton has cousin Joe along for the ride". canoe.com. Retrieved March 16, 2018. ^ Gackle, Paul (November 18, 2017). "Three things to know: Bruins goalie denies charges of wrongdoing in last game vs. Sharks". Mercury News. Retrieved March 24, 2018. ^ Schlanger, Talia (October 26, 2017). "Gord Downie's Final Album Is A Gift". npr.org. Retrieved March 24, 2018.